The accounts payable control account or purchases ledger control account, is an account maintained in the general ledger used to record summary transactions relating to accounts payable. The balance on the accounts payable control account at any time reflects the amount outstanding and due to suppliers by the business for credit purchases. A reconciliation between the control account and the total of the individual supplier accounts (personal accounts) in the subsidiary ledger, forms an effective internal control procedure for the business to ensure that all transactions have been correctly posted. The two main transaction types for accounts payables are credit invoice purchases transactions, and the payment of cash to suppliers. In a typical bookkeeping system where the control accounts form part of the double entry posting, the accounts payable control account is used for each of these types of transaction as follows. Purchases invoices are generated when credit purchases are made from suppliers. The purchase invoice acts as the original accounting source document for the transaction. For example, two invoices might be generated, one from supplier A for 400, and a second from supplier B for 200. 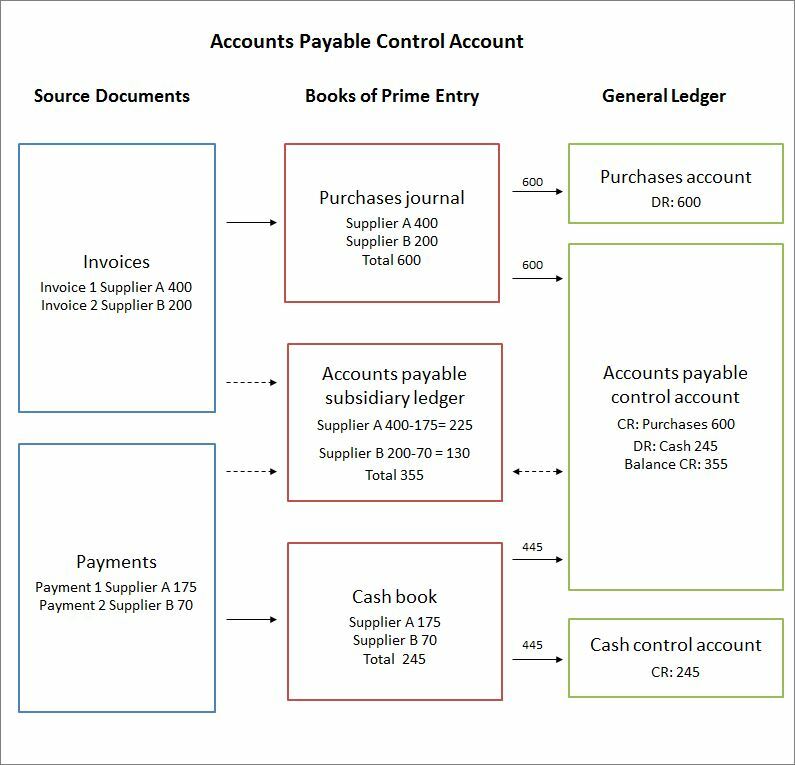 The purchase invoices are used to enter details into the book of prime entry which, for credit purchases, is the purchases journal (purchases day book). The purchases journal is simply a listing of the purchases invoices. The purchase invoices are also used to enter details of the purchases from each supplier in the accounts payable subsidiary ledger. The subsidiary ledger is a listing of personal accounts, one for each supplier. The accounts payable subsidiary ledger does not form part of the double entry bookkeeping process. The purchases journal is totalled for the accounting period, and used to make a double entry posting to the general ledger. The purchases are posted to the debit side of the purchases account, and to the credit side of the accounts payable control account. The general ledger and in particular the accounts payable control account does form part of the double entry bookkeeping process. It should be noted that following this posting, the total on the accounts payable control account of 600, is equal to the total of the personal accounts in the subsidiary ledger of 400 + 200 = 600. The next main type of accounts payable transaction is the payment of cash to the supplier for the outstanding invoice. When a business makes a payment to a supplier for an outstanding invoice either a check will be issued or if paid directly from the bank account, an entry will appear on the bank statement of the business. The check and the bank statement are both source documents in relation to the cash payment transaction. The source documents are used to enter details into the book of prime entry which, for payment transactions, is the cash book. For example, two cash payments might be paid, one to supplier A for 175, and a second to supplier B for 70. In this example, the business uses a cash control account in the general ledger, and the cash book does not form part of the double entry system, and is simply a listing of the cash payments. The source documents are also used to enter details of the payments for each supplier in the accounts payable subsidiary ledger which now appears as follows. The cash book is totalled for the accounting period, and used to make a double entry posting to the general ledger. The cash payments are posted to the credit side of the cash control account, and to the debit side of the accounts payable control account. The accounts payable control account is now as follows. Again it should be noted that following this posting, the total on the accounts payable control account of 355 is equal to the total of the personal accounts in the subsidiary ledger of 225 + 130 = 355. The use of the payables control account as described above is summarized for easy reference in the following diagram. The purpose of the payables control account is to allow the transaction details relating to each supplier to be maintained in a separate subsidiary ledger while keeping the summary postings to a minimum in the general ledger. By having the control account in the general ledger, a trial balance can be extracted without reference to any other accounting ledgers. Part of the period end bookkeeping process is to reconcile the balance on the accounts payable control account in the general ledger to the total of the balances each of the supplier accounts in the subsidiary ledger. If the balances do not agree then it means there must be an error in one or both of the ledgers. It should be noted that in the above example, the subsidiary ledger and the purchases journal are independently completed from the source documents. By adopting this procedure any differences between the purchases journal, which is used to post the control account, and the subsidiary ledger will be highlighted when the control account reconciliation is carried out.